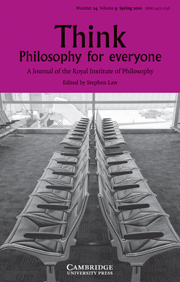 My paper “A New Euthyphro” has been published by the journal Think: Philosophy for Everyone (a journal of the Royal Institute of Philosophy) volume 9, issue 25. Think is an enjoyable journal featuring presentations of complex philosophical issues in a stripped-down digestable way for a wider audience than just those with graduate degrees in philosophy. In fact I think that presenting issues in this way is precisely the philosopher’s role, to serve the wider human community and not just the academic elite. In this paper I present a modern version of the classic dialogue Euthyphro by Plato, a dialogue that was once thought (and still is by some outside the field of philosophy of religion) to have demolished the idea that morality is determined by the will or commands of God. In this version, however, Euthyphro is given a fighting chance by being allowed to share the insights of modern philosophy of religion and meta-ethics as it has dismantled Plato’s critique. The paper was actually accepted for publication in this journal in 2007, but after quite some months the editor’s computer crashed, and the article, along with my contact details, were lost. A couple of years later when nothing seemed to be happening I got back in touch, found out what had happened, and the wheels started moving again, and now at last it has rolled off the press. New Article: "A New Euthyphro"
Previous Previous post: Are churches charities? Next Next post: Education and Morality: Are smarter people more virtuous? I’ll have to take a look at this article. The Euthyphro question is really important to me as some cruder versions of DCT bother me. Speaking of Think will you one day critique Stephen Law’s The God of Eth theory? Peter, I’d have to read it first. 🙂 Do you know where I can find it? On his blog maybe? http://www.stephenlaw.blogspot.com (I think that is it). You could also find in it Russell Blackford’s 50 Voices for Disbelief book. Thanks Peter, I’ll see what I can find. You might also like to check out that Blackford’s book. A number of high profile philosophers and such give their opinions for being atheists, such as Singer, Tooley, Savlescu etc. Could make for a good book review! Just to clarify your post, there are a few academic atheists who still think Euthyphro works against theism. One example would be Louise Antony. Her atheistic Platonism is by no means common, but she holds to it. Ranger – then a book review it shall be! And yes, some academics do still think that the Euthyphro dialogue contains good arguments against theistic ethics (especially a divine command theory). I think such academics are simply out of touch with good arguments about the issue if that’s what they think. I recently found your article “A New Euthyphro” online while searching for material on the Euthyphro Dilemma. Since then I’ve been looking over your site and listening to a few of your podcasts. I find it all fascinating and I hope to be able to delve further into the blog’s archives, and maybe to leave a comment here and there as well. I do have a couple of questions I was hoping to pose about “A New Euthyphro,” though I know this particular post is now outdated, as blog posts go. One question is about metaphysical possibility. When you say (on page 11) that there exists the metaphysical possibility that God could command torture even though his nature prevents him from doing so, what do you mean? I am taking the following to be true (in the article): first, given God’s nature, He cannot command torture, and second, God’s nature is necessary and cannot be other than it is. Given these points, what does it mean to say that it is metaphysically possible that God could command torture? To state my confusion more precisely: I admit to not understanding how necessity and possibility function in this sort of situation (i.e. my problem is not specific to philosophy of religion). If God’s manner of existence is necessary, and if something else follows from God’s existing as he does, then is that thing that follows also necessary, or does it remain contingent even though it must be the case (given that it follows on something that is necessary)? And if it remains contingent, is it called metaphysically possible for this reason, or for some other reason? Secondly, near the end of the dialogue you have Euthyphro argue that the reason for it being right for us to do something (i.e. God’s having commanded it) can be different from the reason why God commanded that thing in the first place. This gets us out of the horn of the Euthyphro Dilemma that accuses God of having to command in accord with what is right, and so being subservient to a standard of goodness above Himself. But do you want to speculate as to what might be the (non-moral) reasons for why God issues the commands He does? Whether you have time to say anything in response to these questions, thanks a lot for helping me better understand the Euthyphro Dilemma, and several other things in the near future, I imagine. Casey, the following illustration may help: Take somebody who is a vegetarian on ethical grounds. She is utterly repulsed by the thought of eating meat. Her nature includes her personality and beliefs with which she cannot part. Her nature therefore prevents her from eating meat. But she is obviously physically capable of doing it. her body is such that she can eat meat. This is the kind of distinction I draw with God. He is metaphysically capable of commanding torture, but his nature prevents him. This was an interesting article and although I had some trouble understanding it I found it to be a good read. God’s nature seems like a defensible position however I’ve always viewed the dilemma itself as flawed. Good is not defined in the argument itself and the question cannot be answered properly. Now normally I would leave the argument there however if you can agree with your opponent on a moral standard then you could prove god is good by nature. Say being charitable is defined by both parties as an objective good. Now ask why can’t god posses these qualities to the highest degree. Since god is eternal, all knowing, and omnipresent this trait would be present for all time, in the best possible way, and in all worlds(real or imagined) This argument doesn’t really work if the person is nihilistic than I just stick to the first. What do you think?